Cuyamaca College’s answer to Coachella returns Saturday, May 6, with the 9th Annual Coyote Music Festival, organized, produced and promoted by students in the innovative Music Industry Studies program. 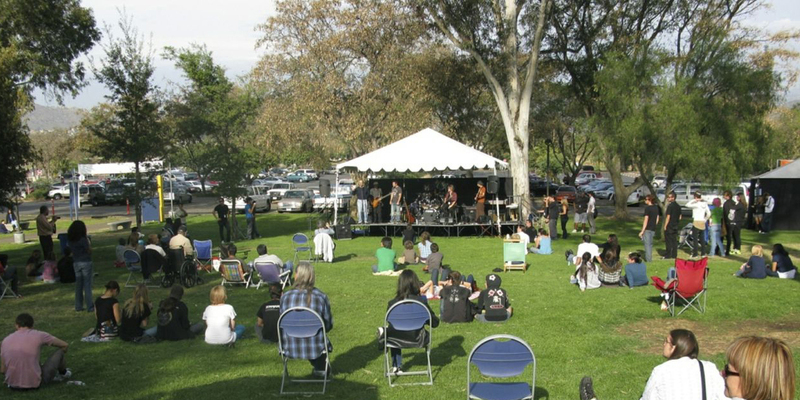 The free, family-friendly event from noon to 4 p.m. will feature two outdoor stages on the Grand Lawn with six local bands playing homegrown music ranging from alternative rock to folk. The students benefit from Cuyamaca College being the only school in the county to offer a transfer degree program that combines training in music theory, literature and performance with studies in music technology and business. That mix of instruction helps students develop as musicians, learn to operate and use the college’s recording studios, work with bands to create demos and other promotional materials, and to plan and produce concerts and festivals with multiple stages. “The Coyote Music Festival is a great way for the community to enjoy original live music in a relaxed setting and it offers students invaluable experience in producing a major event that teaches them a multiplicity of skills,” said Annie Zuckerman, a Business Office Technology instructor who teaches the marketing and promotions aspect of the event. Team teaching the course is Taylor Smith, head of the college’s performing arts program who is also a musicologist and performing artist. The Coyote Music Festival is the culmination of a semester-long project that teaches students all the production aspects, including planning, auditions, promotions, staging and sound engineering. The class called the Music Industry Seminar is a course so rich in content that students are able to take it up to four times, each year learning a new aspect of putting on an event of the music festival’s scale. (Noon-12:35 p.m.) Geoff Bradley and David Woody, a bluegrass, acoustic rock and alternative folk duo who have played off and on for 40 years at venues including Java Joe’s, a staple in San Diego’s acoustic music scene, and California Sol Restaurant and Bar in Spring Valley. (12:40-1:15 p.m.) Barrie Dempsey, a folk/blues artist who has performed with a band and as a solo artist for more than 30 years, is making a return engagement at the Coyote Music Festival, where he played in 2015. With his guitar, harmonica and flute, he performs one to three times a week at farmers’ markets, Seaport Village and similar venues. The La Mesa musician and songwriter won Artist of the Year honors in the country music category at the 25th Annual Los Angeles Music Awards in 2015. He recently won an honorable mention in the San Diego Songwriter’s Guild Annual Song Contest and in March, was named the Best of Las Vegas Solo Artist at the 2017 Las Vegas Producers Choice Awards. He is currently in the studio, working on his next CD. (1:20-1:55 p.m.) Peter Ray, an Americana duo with Pete Filacio on vocals and guitar, and Doug Tyler on guitar, plays monthly at venues including Bolt Brewery and Hooleys Irish Pub, both in La Mesa. (2:40-3:15 p.m.) Bobby Michaels, a solo folk rock vocalist for 30 years who plays the guitar, ukulele and mandolin several times a week at such venues as Brick 15 Coffeehouse. He is a return act at Cuyamaca College, having played at the college’s Winter Wonder Jam in 2015. (3:20-3:55 p.m.) Everything Undone, an alternative/hard rock band with brothers Tristan Brooks on guitar and vocals and Jagger Brooks on drums; Eric Lawrence, guitar and piano; and Jagger Saling, bass guitar, vocals. 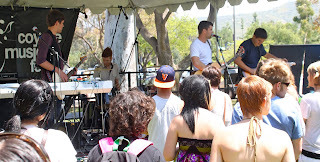 Influenced by ‘90s alt, electronic, and Japanese rock, the band released its EP, “Disappear,” in 2016, and has performed at many venues in San Diego and Los Angeles, most recently at SOMA San Diego, a leading venue for punk and alternative-rock concerts. In addition to original live music, festival-goers can enjoy Aunty Lynne’s food truck, which sells Pacific Rim-inspired cuisine, and other vendors selling various wares. Parking is free and lawn chairs are permissible. Information about the Music Industry Studies program can be found online. Cuyamaca College is at 900 Rancho San Diego Parkway, El Cajon, California 92019.